Redondo Beach, California. 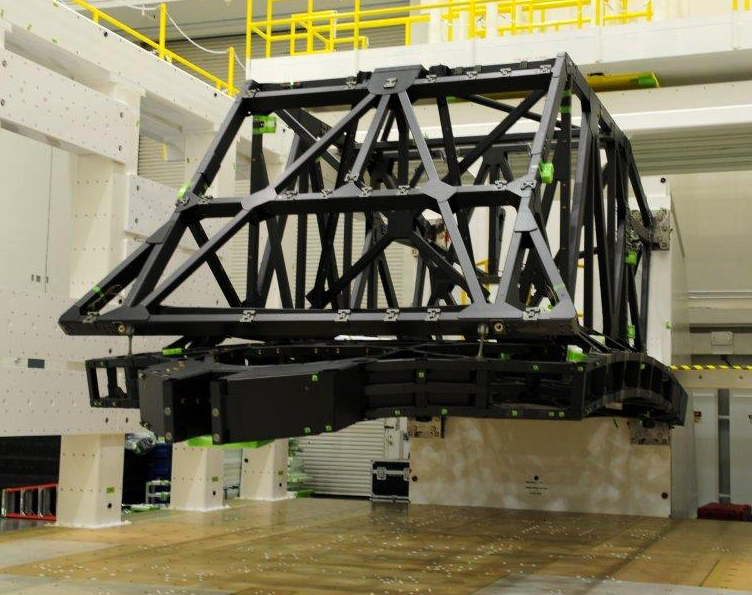 July 9, 2014 – Northrop Grumman Corporation and teammate ATK have completed static testing of the primary mirror backplane support structure (PMBSS), moving NASA’s James Webb Space Telescope one step closer to its 2018 launch. The structure was delivered to Northrop Grumman’s facilities in Redondo Beach, completing a critical path program milestone. Static testing demonstrates that the backplane has the structural integrity to withstand the forces and vibrations of launch, and is the final test prior to starting the integration of the backplane with the rest of the telescope. The PMBSS is one of the most lightweight (given its size and complexity), precision-alignment truss structures ever designed and built. It is the stable platform that holds the telescope’s science instruments and the 18 beryllium mirror-segments that form the 21-foot-diameter primary mirror while the telescope peers into deep space. The primary mirror, built by Ball Aerospace, is the largest mirror in the telescope and the one that starlight will hit first. Northrop Grumman is under contract to NASA’s Goddard Space Flight Center in Greenbelt, Maryland, and leads the industry team that designs and develops the Webb Telescope’s optics, sunshield and spacecraft. ATK designed, engineered and constructed the more than 10,000 parts of the entire PMBSS at its facilities in Magna, Utah. They used composite parts, lightweight graphite materials, contemporary material sciences and advanced fabrication techniques to build the structure. The highly efficient PMBSS will meet unprecedented thermal stability requirements to minimize changes in the shape of the telescope caused when one side is hotter than the other. While the telescope is operating at a range of extremely cold temperatures from -406 to -343 degrees Fahrenheit, the backplane must not move more than 38 nanometers or approximately 1/1,000 the diameter of a human hair. Last fall, the structure underwent extreme cryogenic thermal testing at Marshall Space Flight Center in Huntsville, Alabama. Next, Northrop Grumman will integrate the composite structures with the deployment mechanisms to create the overall optical telescope element structure, which will then be shipped to NASA Goddard for integration with the mirrors. NASA and Northrop Grumman will continue cryogenic testing of the PMBSS structure after mirror integration is complete.